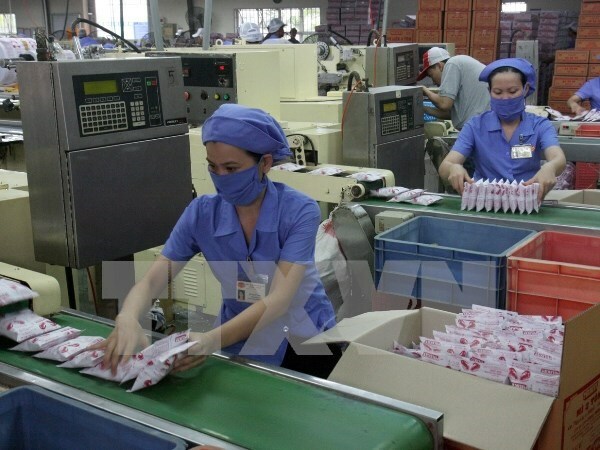 Hanoi (VNA) – As many as 13,102 new enterprises were established in April, the highest figure in the past 12 months, representing a month-on-month rise of 8.9 percent, according to the General Statistics Office (GSO). According to the GSO, total registered capital of the firms set up in April was 98.4 trillion VND (4.3 billion USD), a fall of 17.1 percent from the previous month. In the first four months of this year, 39,580 enterprises were established with combined capital of 369.6 trillion VND (16.25 billion USD), up 14 percent and 48.9 percent year on year, respectively. Together with 455.7 trillion VND (20.04 billion USD) added into already established firms, 825.3 trillion VND (36.2 billion USD) was pumped to the economy in the first four months of 2017. At the same time, 11,545 businesses resumed operations, an increase of 1.9 percent year-on-year. In January-April, respective surges in new enterprises and investment of information and communication technology were 237.2 percent and 44.9 percent, real estate, 66 percent and 49.9 percent, education and training, 30.4 percent and 84.2 percent, employment service, equipment renting and support services, 18.2 and 145 percent. Meanwhile, power, water and gas production and distribution saw a rise of 34.4 percent in the number of new firms, while those of agro-forestry, seafood are 21.8 percent, and other services hit 19.9 percent. However, the fields experienced a fall in capital of 3.2 percent, 12.9 percent and 12.4 percent. In the first four months of 2017, growth in the number of new firms was recorded in all regions, including northern midland and mountainous region with 1,724 firms, a rise of 29.9 percent, the Red River Delta with 12,028 firms, up 18.9 percent, and the Central Highlands with 1,021 firms, an increase of 14 percent.